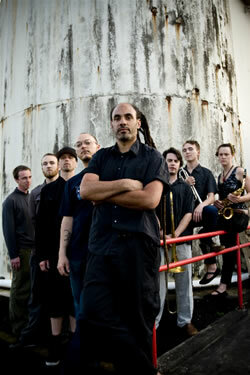 Easy Star Records will release Amplify, the new CD by the progressive reggae band John Brown’s Body on September 30. The album features twelve original tracks, showcasing the group’s broad palette of influences – from classic UK reggae of the 70’s to West African instrumentation, from indie rock to spaghetti westerns. This album, the group’s first since 2005’s Pressure Points (Easy Star), features a new band lineup and many special guests. Since the release of JBB’s last album, the band, which hails from Boston and upstate New York, has gone through significant changes. Lead singer Elliot Martin underwent throat surgery, several band members departed and most significantly, the band suffered the loss of bassist Scott Palmer. Palmer lost his battle with cancer in 2006, only six months after his diagnosis. That subject is addressed in the song "Ghost Notes." Emerging from these changes, the band’s current line-up is a focused, more experimental outfit than ever before, challenging the usual notions of contemporary reggae. Use of instruments like the African kora and cello on the track "So Aware," and the hip hop influences all over songs like "Shake The Dice" and "Make Your Move" continue an evolution of sound that could be heard on JBB’s two previous recordings, and is now front and center on this release. Recent live showstoppers like "Give Yourself Over," "Zion Triad," and "Push Some Air" are included here too. And "Speak Of The Devil" features a vocal collaboration with Vaughn Benjamin of Midnite, whom JBB front man Elliot Martin considers "ridiculously prolific and the most progressive reggae artist out there." Amplify is produced by Elliot Martin and Jason "Jocko" Randall, the band’s longtime sound engineer. It was recorded in upstate New York at More Sound Studios. Fans can pre-order the album through Easy Star’s web store <<link to: http://easystarrecordspreorder.shop.musictoday.com/Default.aspx >> and pick up a brand new tee shirt or tank top at the same time.